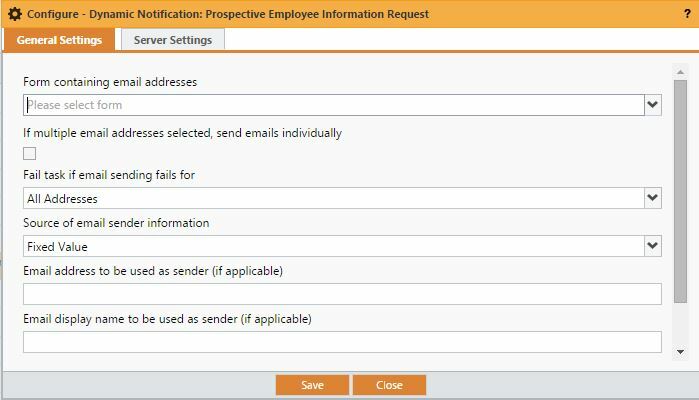 The Dynamic Notification plugin allows email notifications to be sent to a dynamic list of recipients based on email addresses provided in a form. Key to this plugin is the ability to send email notification (and subsequently request data or related information) to interested parties regardless of whether they have login access to the Integrify system. 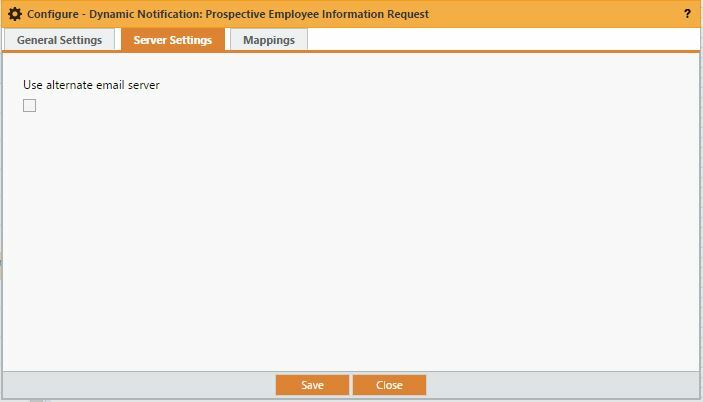 To configure the Dynamic Notification plugin select it from the Task options and drag it to your process canvas. Form Containing Email Addresses: This is the form in the process where the recipients of the notification are inputted. Fail task if email sending fails for: Any Address, All Addresses, Never Fail. This is used to determine error handling in the event that one of the inputted emails is not correct. In the case of more than one recipient, this will determine if the entire task will fail in addition to the email notification not making it to that recipient. - Never Fail will push the task to a Completed state regardless of email receipt. Source of email sender information: This gives the administrator the option to set a static email address as the sender (from address) of the email notification. If multiple email addresses selected, send emails individually: Yes/No. The system defaults to No, or unchecked, for this question. Should you want to recipients to be segregated from one another you can check this option. Email Address to be used as Sender: If Fixed email sender information is selected this field should be completed to set that information. Email Display Name to be used as Sender: If Fixed email sender information is selected and you wish to have a separate Display Name show as part of the email that information can be entered in this field. To continue to configure this plugin click 'Save' then select the Server Settings tab. This Yes/No check box will allow you to select and set an alternate server should you wish to send this notification from an address other than your default Integrify email. Here you will see each of the fields contained in the Form that you mapped on the General Settings tab. 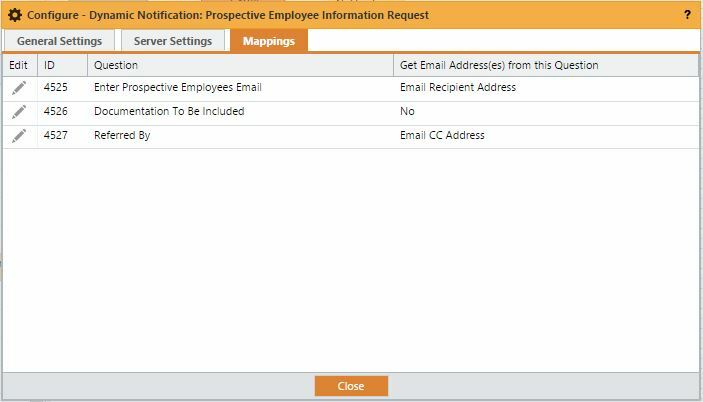 To set a question as a parameter for the notification click on the Edit icon and select the Email Address that you want to map to the form data. 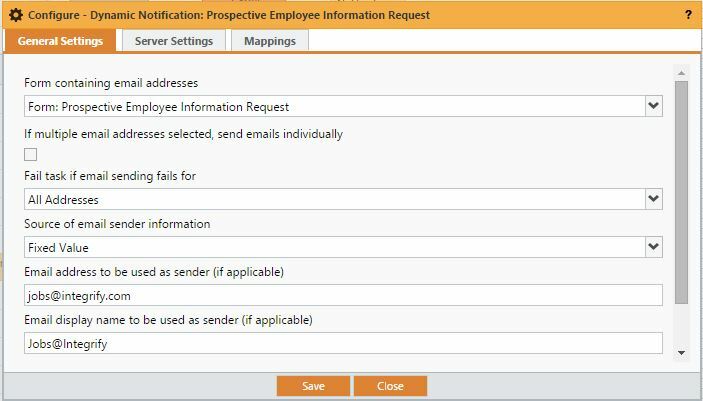 Dynamic recipients can be set for the Email Recipient Address, Email Sender Address, Email Sender Name and Email CC Address. By default each question will be set to No. Click 'Save' and 'Close' to continue. To configure and customize the Notification itself follow the instructions provided under Notification Settings > Tasks. 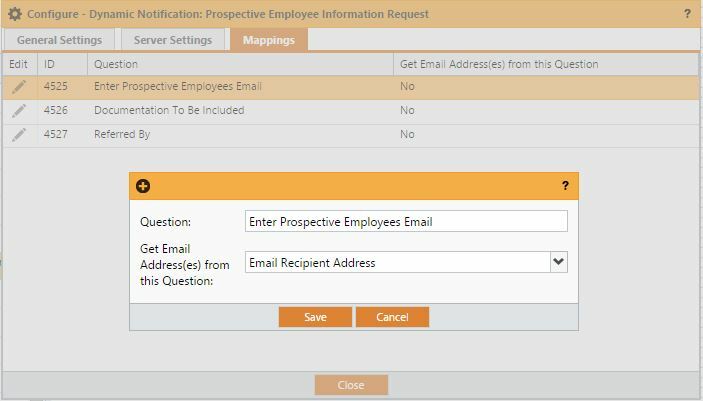 As a training example we will be using a "Prospective Employee Request Form" designed to capture the email address of someone that might be interested in employment or job information. 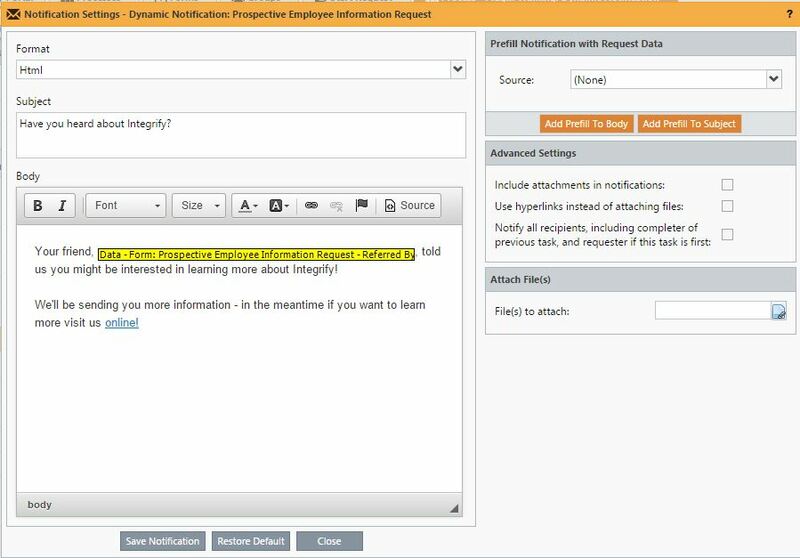 After the form is completed the Dynamic Notification task will send them an email, with a CC to the requester.